ESTERDAY WAS THE FEAST of Nossa Senhora Aparecida. Because she only appears on the calendar of saints particular to Brazil, I couldn’t celebrate her liturgically. I did, however, offer Mass for the memorial of the Blessed Virgin Mary on Saturday with Our Lady of Aparecida specially in mind. One of the greatest blessings of my pilgrimage to World Youth Day in Rio was a side trip to the mammoth, 45,000-seat basilica in Aparecida. It was not the size of the place, of course, that made the visit remarkable. It was rather the opportunity to stand and pray in the presence of the miraculous statue of our Lady that is as important to Brazilians as the tilma is to Mexicans. One day in October 1717, there were three fishermen out on the river Paraíba. The fishermen were having a hard time finding any fish, so they called upon Our Lady of the Immaculate Conception for assistance. When they lowered their nets, they caught a headless statue of the Blessed Virgin. After lowering their nets again, the head, too, was salvaged. Then, much like the similar Gospel story, they lowered their nets one more time and made a tremendous catch of fish. From that day forward, they attributed the miraculous catch to the intercession of our Lady. She was given the title “Nossa Senhora Aparecida,” meaning, “Our Lady Who Has Appeared,” referring to the statue dredged from the river. 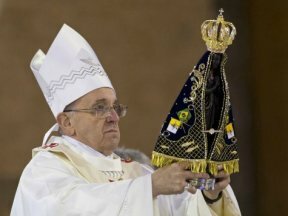 The dark colored statue, less than three feet tall, is presently enthroned in the great Basilica in Aparecida and serves as the precious icon of the Patroness of Brazil. Today, looking forward to the World Youth Day which has brought me to Brazil, I, too, come to knock on the door of the house of Mary—who loved and raised Jesus—that she may help all of us—pastors of God’s people, parents and educators—to pass on to our young people the values that can help them build a nation and a world which are more just, united and fraternal. Throughout the World Youth Days, themselves, a replica statue of Aparecida was displayed to the side of the altar erected on Copacabana Beach. At one point, the Holy Father even blessed the crowd with the statue. The pope’s love for the Blessed Mother, in particular under this title, was evident. This weekend, at the direction of the Holy Father, we are consecrating the whole world to the Immaculate Heart of Mary. Many parishes around the globe are offering the same prayer at the conclusion of Masses all weekend. As a product of Catholic schools staffed by the Sisters, Servants of the Immaculate Heart of Mary (Immaculata, PA), I am thrilled by this consecration. In this month of the holy rosary and on this anniversary of the apparitions at Fatima, what better could we do than consecrate this world in which we live back to God, Who gave it to us? The Holy Father is inviting us to step closer to the Blessed Virgin. When we strive to be like Mary, we embrace her virtues—kindness, gentleness, compassion, humility, strength, peace. When those virtues become a part of us, something miraculous transpires. Our Lady “appears” again. She appears in us and through us to all those around us.